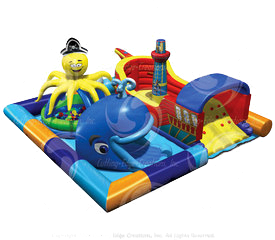 This Sea Park large Combo Bouncer is perfect for indoor and outdoor events. Your little ones can slide, go through obstacles and play in the ball pit.Bright and colorful characters. It features an inflatable safety ramp at the entrance to protect excited kids as they scramble to get inside the bouncer. It also has large netted vent windows that keep things cool for the kids and allows parents to keep a watchful eye on all activities inside. Should be set up on grass or a padded area as it doesn't have an inflatable bottom. Appox 6-8 users at a time.